Yogesh Chabria - The Happionaire ​Blog - Best Motivational Speakers In India - Inspiration, Success: How Do I Start Investing? I get several e-mails asking me how to start investing. I have been getting these e-mails from people in various fields. IT, medicine, law, the army, advertising, media, housewives and even from students both in India and abroad. Some of you want to start investing full time while others want to maximize returns on their money. A few of you ask direct questions and share your entire portfolio. It is very humbling for me to see so many of you putting faith into me, simply by reading my writings. Even though I would love to help each one of you individually, at the moment I have still not set up a system which will allow me to do this efficiently. However I have realized that I can start helping many more people take control of their finances by sharing ideas on how to invest. 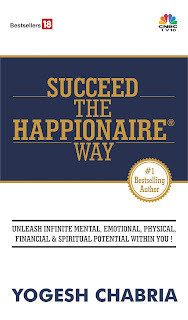 My first book- Invest The Happionaire Way, under "The Happionaire" series is a reply to all those wonderful people who have sent me e-mails and queries regarding "How to start investing?". Be assured that as soon as the book hits bookstores, you shall be the first to know! You could be a young student or somebody much more senior, you could start your journey by reading this book and finding out how I started learning about investing. I do not have a formal finance degree and whatever I have learnt has been through practice and experience. Now a few of you also send me queries on areas which are a bit more in depth. PE ratios, EPS, Book Values, etc. these too shall be dealt with soon. Others have asked if I have any course or institute through which they can learn more about investing. Inshallah gradually I shall look at helping as many people I can by entering those areas. The best way to start investing is to invest in knowledge! Do keep the e-mails and the feedback coming and remember no matter what analysts or people around you say, use your own mind. Because at the end the best person to trust with your money is you. Have you taken part in the interesting discussions below? Thanks for addressing my query through the post. I am a PhD student in USA and have never invested in stocks, but plan to start with reading your book. As you said it is best to have knowedlge before starting. I'm eagerly waiting to get your book. A few of my friends here told me how a few years ago they invested based on your advice in GMR and the huge returns they got. I hope to do the same here. I hope you continue spreading your ideas and helping us. I know you must be very busy but please don't stop sharing your ideas as we really need a guru like you who is so humble and explains in such a simple way. I'm with Goldman Sachs and even though I have been involved with capital markets for over a decade now, I have never come across somebody who is able to attract so many people who have a limited finance background. I surely agree with what you say, and even though it seems ITHW would be book for people just starting out. I would like to have a copy and follow your advice of investing in knowledge. No matter how experienced we are more knowledge always translates into more wealth. I had put most of my money in properties. I have sold a few properties and plan to invest this in the stock markets. I am looking for your help and guidance Yogeshjii. I hope you are able to take some time out and make me your student. Mr. Chabria my query is the same like Mr. Ashish. I sent you an e-mail but i did not get a reply. i am assuming you are busy but please also tell me how i can get more advice on my investments from you.